You might not remember the Mansell GameStop store from the Grand Theft Auto IV launch, but GameStop certainly does. Back in April, when GTA IV launched, I did a piece comparing the lively, cheery event held at the Windward Parkway location in Alpharetta versus the rather staid, everyone just standing in line deal held at the Mansell location, and GameStop corporate took notice, relaying their displeasure in a memo that branded me "The Tale of Two GameStops" guy at the store. Last night I made the trip down the street to the Mansell location for the midnight launch of EA's Madden NFL 09, and things were definitely different. It's amazing what a little corporate prodding and a more enthusiastic store manager can accomplish. I would have called the story A Tale of Two GameStops revisited, but if they get it right the first place you go you don't need to go anywhere else. This time around, Mansell pulled out all the stops. 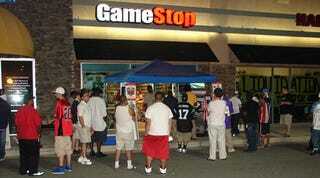 They had a tent set up outside the store with kiosks so players could get their hands on the game a little early. They had two coolers filled with non0alcholic party beverages. Not only did they have Papa John's pizza there, they also had several boxes of wings from the nearby Hooters (considered a family restaurant in the South), along with two lovely Hooters girls in oversized football jerseys who did far more than serve food, if you know what I mean. They also tossed the football back and forth, and at one point one of them tried her hand at the game on the PlayStation 3. "I have no idea what I'm doing," she worried. I know exactly how she feels when it comes to football games and football in general. At one point in the evening one of the two Nerf footballs that were being tossed about in the parking lot landed in my unsuspecting hands, leaving me staring at it as if someone had just handed me a dead baby. The same Hooters girl gently took it from my grasp, saving me from the embarrassment of actually trying to throw it myself. The night passed relatively quickly and without major incident. I chatted with the GameStop district manager Mike for a bit, who said, "Ah, A Tale of Two GameStops" after I introduced myself as a writer for an online gaming website. The Hooters girls passed out fliers for their upcoming Guitar Hero tournament. The police stopped to check up on things, refusing my offer of ice-cold Dr. Pepper that no one else wanted. Things wrapped up around 11:45PM with the raffle of an Xbox 360 faceplate and a Atlanta Falcon's cap, after which everyone lined up and quickly got their games and departed. This wasn't just a game launch. It was a memorable event, which is exactly what I said a game launch should be in the original article. The big difference between the GTA IV launch and this one? This guy right here. There wasn't a day that I went into the Mansell GameStop this past month that I didn't hear the new manager, Louis Lanius, telling everyone who came into that store about the big Madden NFL 09 launch. He ordered pizza, worked out a deal with the local Hooters that could result in his store co-sponsoring a Guitar Hero tournament with the restaurant, and even bugged his DM to get him a tent so the festivities could continue rain or shine. Even better, he was outside with the fans the whole evening, tossing the football, talking about the game, and generally being a part of the celebration, rather than being the stodgy guy looking through the glass from inside the store, wishing he were home. Damn fine work Louis. Looking forward to what you come up with for the Star Wars: The Force Unleashed midnight event. As for Madden NFL 09, it looks very shiny in its protective cellophane, sitting on my coffee table. I'm a bit scared to unwrap it for fear that it will unleash my inner beast, which will then get spooked by the cats, bursting out of my apartment door in a desperate attempt to escape, leaving me with no inner beast at all. That cannot be a good thing, so I am sticking to Final Fantasy Fables: Chocobo's Dungeon for a few more days before chancing it.